Many small or medium sized businesses struggle when they evaluate CRM systems. They often think that the solutions won't fit their unique business needs or that it's just too expensive and time consuming to be worth their while. The good news is that by choosing Microsoft Dynamics CRM and PowerObjects as your partner, you have a wealth of tools and resources to make your initial implementation and maintenance easy! Hi, I’m Brady. Today we’re here to talk about Microsoft Dynamics CRM, how small businesses evaluate CRM, some of the issues they face, and how PowerObjects can help alleviate those concerns. The first concern that many small businesses think about is cost when it comes to implementing and maintaining Dynamics CRM, when in reality Dynamics CRM costs a stagnate rate, covers up to five licenses so that you can really grow your business without worrying about incurring additional expenses. The next issue that small businesses face when it comes to implementing Dynamics CRM is time. We understand your trying to grow your business, that’s why working with a partner like PowerObjects, we can help provide best practices and guidance along the way. The final concern that many small businesses have is, how am I going to maintain and operate my system? That’s a very valid concern, but don’t worry PowerObjects has plenty of resources to help you along your journey. For example, one of the resources we have here is PowerStart. A structured six hour training that goes through customization, navigation, importing data, and much more. 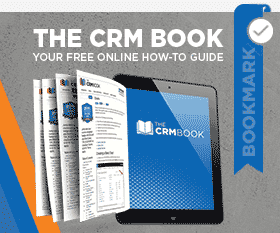 Another resource available to you is our CRM book. A free online resource that covers topics ranging from the basics all the way through more advanced topics such as extending and administering your CRM. We also have our blog. Be sure to subscribe to it for CRM tips and tricks delivered straight to your inbox. Also, check out our library of webinars on demand. It’s instant CRM education at your fingertips. For more information, check out some of my recent webinars. Be sure to sign up for my new webinar on importing data, and also feel free to reach out to me directly. I’d love to talk CRM with you. Thanks for watching The CRM Minute. January 28, 2019 Alexandra Brown	Be the first to comment. November 16, 2017 Ashley Waalen	Be the first to comment. PowerChat is a marketing automation add-on that gives Dynamics 365 users the ability to interact and track conversations with visitors on their web page.